APROBACIÓN LA ENAJENACIÓN DE DOS PARCELAS DE PROPIEDAD MUNICIPAL AL SITIO DEL CAMINO DE LOS MOLINOS. 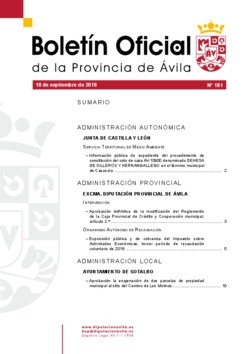 INFORMACIÓN PÚBLICA DE EXPEDIENTE DEL PROCEDIMIENTO DE CONSTITUCIÓN DEL COTO DE CAZA AV-10900 DENOMINADO DEHESA DE SILLEROS Y HERNANGALLEGO EN EL TÉRMINO MUNICIPAL DE CASASOLA. EXPOSICIÓN PÚBLICA Y DE COBRANZA DEL IMPUESTO SOBRE ACTIVIDADES ECONÓMICAS, TERCER PERÍODO DE RECAUDACIÓN VOLUNTARIO DE 2018. APROBACIÓN DEFINITIVA DE LA MODIFICACIÓN DEL REGLAMENTO DE LA CAJA PROVINCIAL DE CRÉDITO Y COOPERACIÓN MUNICIPAL, ARTÍCULO 2º.